Are you taking thyroid medications and wish there was a safe alternative? Do you have all the symptoms of thyroid disease, but you are continually told it is normal? Often small variations in thyroid levels that are within the medically normal range can create severe symptoms. Many physicians only test the TSH, however to accurately diagnose thyroid disease it is necessary to order the appropriate tests and to interpret them correctly. It is important to run T3 uptake, T4, T7 and at times other tests like Reverse T3, thyroid immunoglobins, and TSH. Other tests that may help influence the thyroid include heavy metal analysis, iodine levels, and lifestyle evaluations. There are natural alternatives to manage and correct thyroid disease that may include vitamins, enzymes, homeopathic remedies and diet modification. 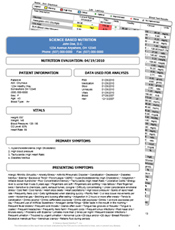 Ask us to order the proper tests, evaluate them and manage thyroid disease naturally.